I can't believe Christmas already came and went. I wait all year long for a couple of days of holidays that fly by in the blink of an eye. It's quite sad to think that now I have to wait another 340 days until next December comes along. Fortunately, New Years Eve is close by and it's what is keeping my excitement alive. But let's go back to talking about Christmas because it really is the most wonderful time of the year. Or at least I think so. What's not to like about Navidad; family gatherings, presents, snow if you're lucky, getting dressed up, etc. and lots and lots of food! This Noel, was bursting with family traditions. Lunch with my mom's family on the 23rd--it's usually on the 25th, but due to itineraries, we had it earlier--, dinner with my dad's family on the 24th, and a second lunch with the remaining of my mom's family today. The reason why I love this holiday so much is that I get to see my cousins, aunts and uncles--or most of them. With a family like mine (spread out around the world) it's hard to come together, but Christmas seems to be a good enough reason. Anyways, moving on to food. I decided to bake a layer cake for my Christmas Eve dinner. Before anything, let me tell you that despite the flaws on the inside the cake looked amazing from the outside and tasted delicious. I wanted to make something like this cake, but I didn't make enough batter and before I knew it there was no time left. I will be trying to bake a similar cake in the near future, but for now, I am proud of the awesome cake we (my sister and I) baked last night. Preheat oven to 350 F. Butter two 9-inch round cake pans and line bottoms with parchment paper. 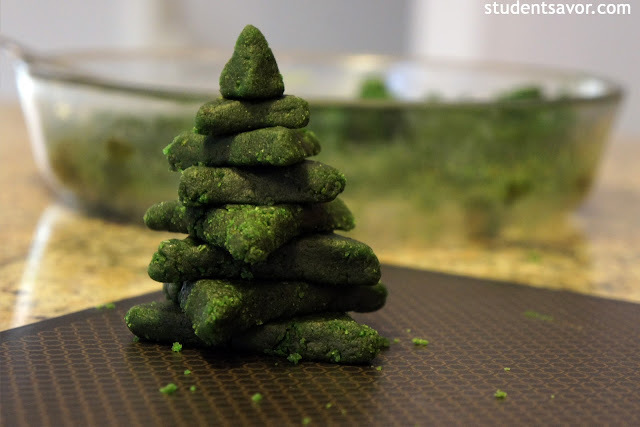 In a small bowl, sift flour and baking powder and set aside. In a large bowl, cream butter with an electric mixer on medium speed until smooth. Add sugar gradually and beat until fluffy, about 3 minutes. Add eggs, one at a time, beating well after each. Add dry ingredients in three parts, alternating with milk and vanilla. Make sure to beat well after each addition, but don't over beat. Using a rubber spatula, scrape down the batter in the bowl to ensure ingredients are blended. 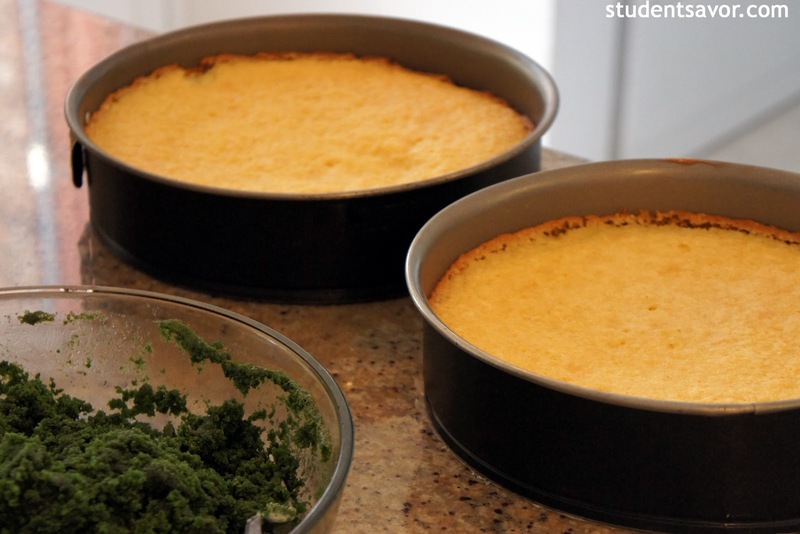 Carefully spoon the batter into prepared cake pans. Bake for 30-35 minutes, or until toothpick inserted in center comes out clean. Let cool completely. Once cakes are cooled, carefully cut a small cone into the center of each, making sure one of the cuts reaches the bottom of one cake. Fill both holes with Green Velvet Cake and place in freezer for about 20 minutes. Remove cakes from freezer and mount one on top of the other. 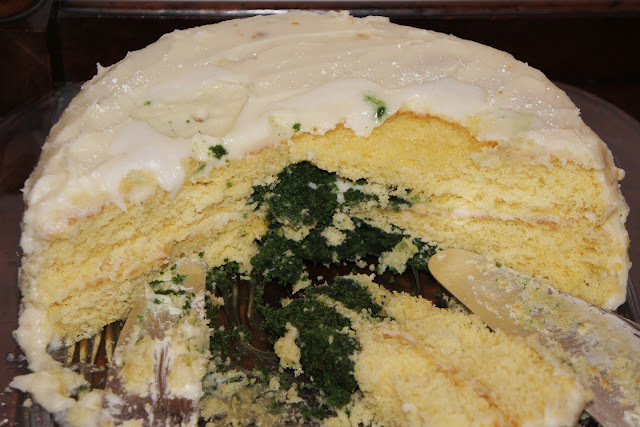 Turn the cake with the larger cone upside down and spread Buttercream Frosting onto the the bottom, making sure not to cover the green tip. Turn the other cake upside down and place on top. 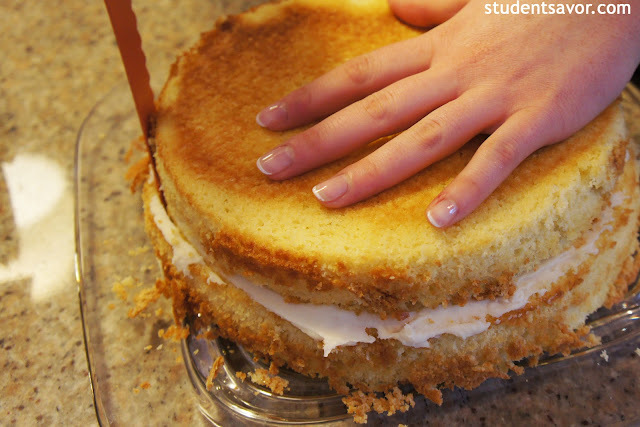 Using a serrated knife, even out the cakes by cutting the edges. 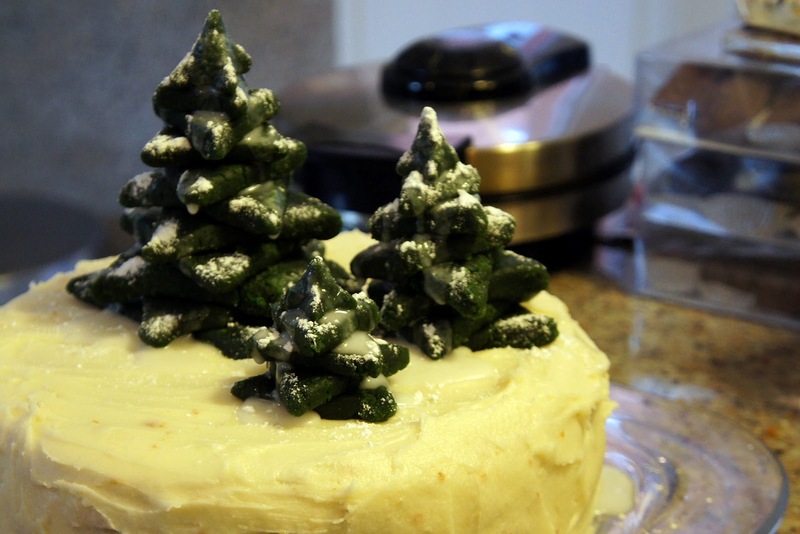 Cover cake with remaining Buttercream Frosting using an offset spatula to even the frosting out. 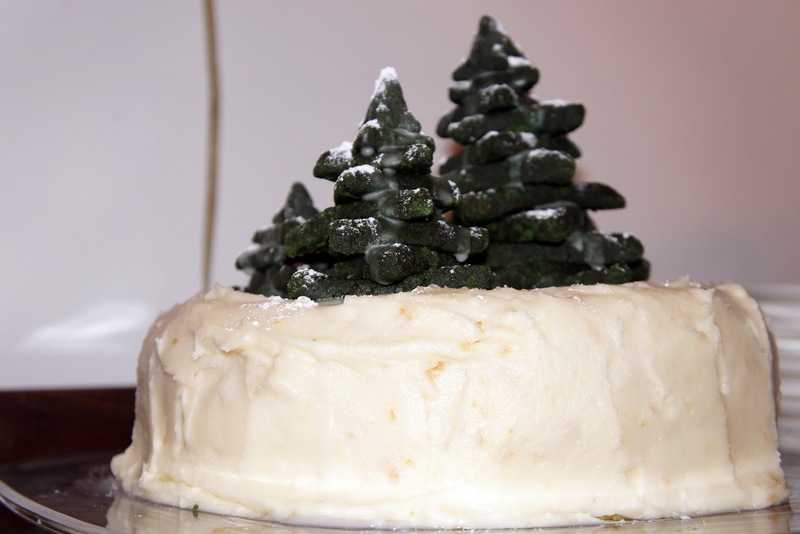 Decorate cake with trees made out of remaining Green Velvet Cake or other decorations. Preheat oven to 350 degrees. Grease one 9.5 inch round baking pan. In a small bowl sift flour and set aside. In a large bowl, cream butter and sugar, with an electric mixer on medium speed, until light and fluffy. Add egg and yolk, one at a time, beating well after each addition. 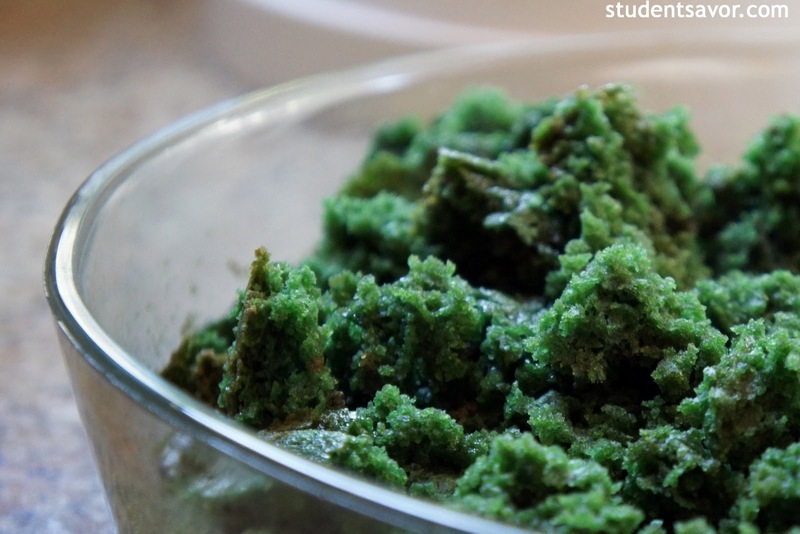 In a separate bowl, combine food coloring, cocoa and vanilla. Add to batter and beat well. Combine salt and buttermilk. Add to batter in three parts, alternating with flour; making sure to beat until incorporated after each addition (but don't over beat). In a small bowl, stir together vinegar and baking soda. Using a plastic spatula, fold into batter until incorporated and batter is smooth. Pour batter into pan. Bake for 30-40 minutes, or until toothpick inserted in the center comes out clean. Remove from oven and let cool for 10 minutes. Using a fork, crumble cake. 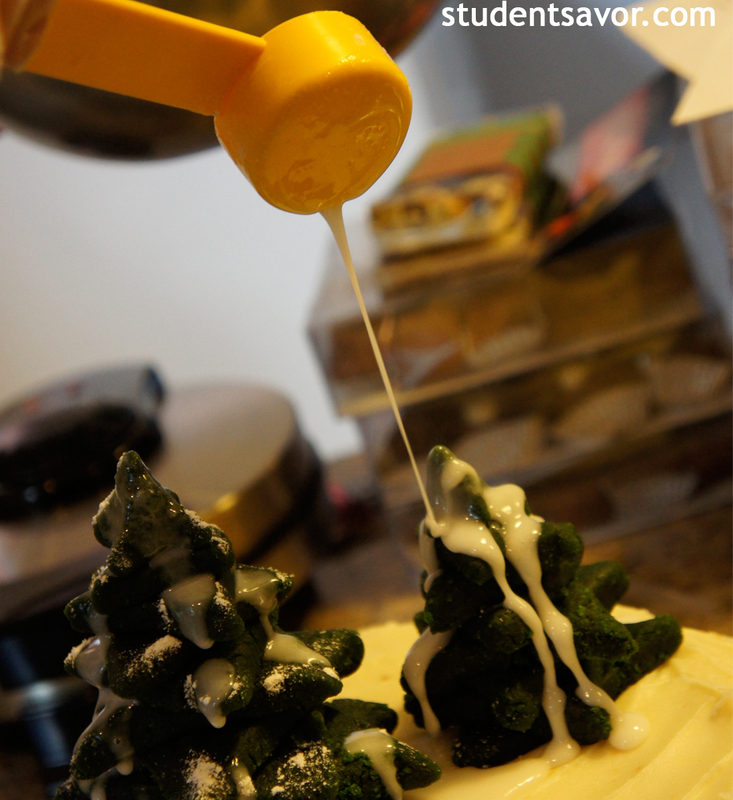 Add 1/2 cup frosting and combine. Set aside until ready to use. In a large mixing bowl, cream butter, 4 cups sugar, 1/2 milk and vanilla, beating on medium speed until smooth and creamy, about 5 minutes. Gradually add remaining sugar, 1 cup at a time, beating well after each addition, and until icing is thick enough to spread. If icing is too thick, add milk, 1 tablespoon at a time, until desired consistency. Leave icing at room temperature until ready to use.